Posted on March 12, 2018 at 9:00 am. As the song goes, “Que será, será. Whatever will be, will be.” But, that doesn’t mean we can’t have a little fun trying to predict what the future has in store for us. Author Keziah Frost has her own method of uncovering the future, using playing cards to craft an elaborate look at what the future may hold. Interested? Click here for Norbert Z’s Guide to Fortune Telling to learn more. What are your hopes for the future. Are you hoping to travel the world? Get a raise? Meet that special someone? 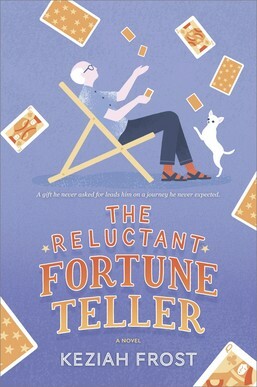 Enter now for a chance to win your very own Guide to Fortune-Telling, plus a custom set of playing cards and a copy of The Reluctant Fortune-Teller by telling us your predictions for the future in the comments below! Giveaway: Answer the above question for your chance to win! Open to residents of the US and Canada, excluding Quebec. Contest closes March 19, at 11:59 p.m. ET. One (1) winners will be selected from all on March 21. For full official rules, click here. I hope to continue in good health during my “golden years”. Too spend time with loved ones across the globe. I’m hoping the future holds health and happiness for me and my family and friends. For the world I just want us to get our act together! Lol! I hope the future holds a second, healthy pregnancy and child for us and much health and happiness for all our loved ones. I’m wishing for a time in this country where everyone is considered equal. Looking forward to travel and good books. I’m looking forward to vacations and reading lots of good books! My wish for the future is that we may learn from the past. My hope is to win the lottery 9or something) at an amount that would wipe away my debts and provide a small cushion of comfort. Not an amount to quit my job, just to get my finances in order and be able to breath!